You may take vacations to interesting places and want to sort photos in Elements according to the location where the photos were shot. You can easily place photos on geospatial maps. In Elements 15, the methods for pinning photos to a map has changed a bit. Click Places in the Media Browser, and the Media Browser window changes to what you see here. Type a location and a submenu displays a map location. 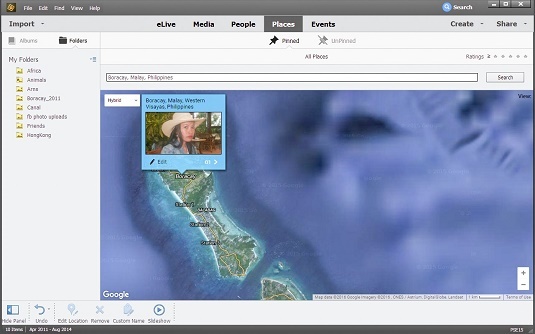 Click the map location and the map changes the view with the photos shown at the left side of the Media Browser. At the top of the window, you see Pinned and Unpinned. When you click Unpinned, the images on the left side of the window display photos that have not yet been pinned to a place on the map. When you click Pinned, you see a collection of photos that have already been pinned to map locations. Click Places at the top of the Media Browser. Click the photos in the Media Browser that you want to add to a new place. Click the Add Places icon at the bottom of the Media Browser. A window appears prompting you to type a name for the location. Type the location name (the city or other location type). The selected images are pinned to the map location. To locate the pinned photos, type the location name in the Search text field and press Enter. The map changes to the location you add to the Search text field. Click Pinned and you see the pinned photos. Search for a location and click Pinned at the top of the Media Browser to display a collection of pinned photos. If you want to sort photos according to location, choose Find → Using Advanced Search. The Organizer view changes, and notice that a column for Places appears. All photos assigned to places are listed in this column. You can easily select the check boxes to find photos assigned to a given place or select multiple check boxes to find photos from several places.